How to paint kitchen cabinets is one of the most asked about topics I get in emails and comments here on my blog. I think mostly because many people would love a kitchen makeover yet they are on a tight budget. 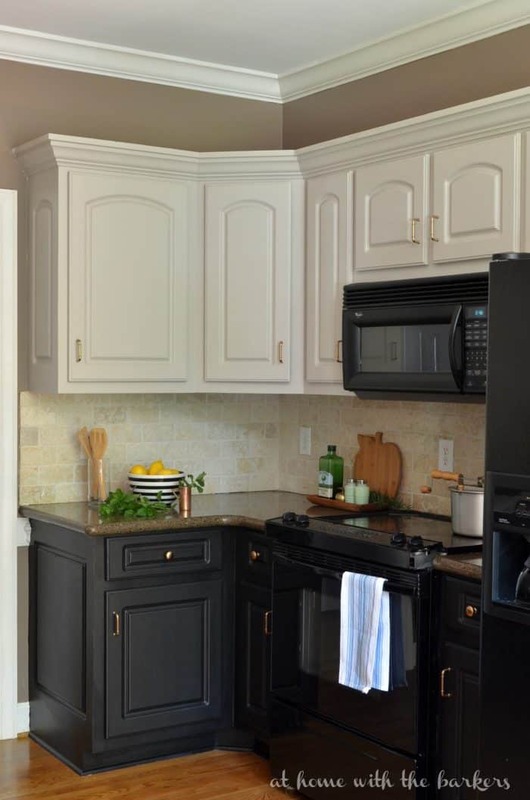 Painting your cabinets yourself is a great way to save money on a kitchen makeover. I saved BIG by painting my own cabinets in my kitchen makeover that I revealed in May. For today’s post I’m going to show you how to paint kitchen cabinets with the paint I used this time around. I’m not an expert on all types of painted cabinets but I have painted enough to feel that I can offer you some great help. PREP WORK! Those 2 words are the what will make or break a beautiful paint job. The best part about chalky finish paint is priming and sanding are NOT necessary BUT cleaning is highly important. Kitchen cabinets get super dirty from grease, food and dust. This is my favorite cleaner that does a great job. I shared more about that process in week 3 of this challenge as well. Make sure you wipe really well and don’t let any of the cleaner behind. This chalky finish paint has worked well for me on many projects so I decided to use it for my kitchen. My colors of choice were Carbon (black) and Primitive (soft gray) but there are many to choose from. The paint comes in smaller individual containers so make sure to get a larger container to mix them altogether. Don’t skip this step. You never know if any of the paint may have be off in color and that will ruin a kitchen makeover. I painted my cabinets in 2 colors and I used 6 of each color in the 8 oz jars. Painting cabinets will require you to remover the doors. It makes the job much easier. I paint the first coat with a paint brush then the second coat with a foam roller. This allows me to get a smooth finish. You can see in the below photo the difference in how my cabinets before and after painting the primitive color. To seal the cabinets I used the Americana Soft Touch Varnish! I love this stuff!! The best part is that you can paint over it with chalky finish paint if and when you change your mind BUT the protection is fantastic. The soft touch varnish goes on just like paint. It is white when wet but dries clear. I did two coats. It is advertised to be a great protections for painted outdoor furniture so I am putting it to the test soon and painting a glider I have on the deck! The below picture is a great example of what to expect. The cabinets on the right that look dull are just the chalky finish paint. The left side has the wet soft touch varnish. So far it has been a 5 weeks since I finished the cabinets and they look fantastic! The finish and colors made a huge difference and I am so happy with how they turned out. FYI…I do paint both sides of the doors but I do not paint this inside boxes or shelves. 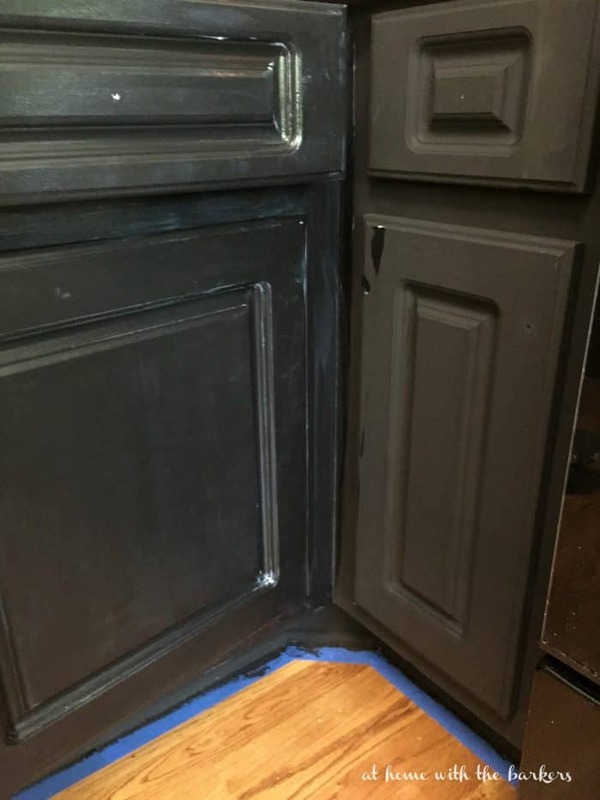 **UPDATE POST: Black Cabinets The Ugly Truth! I am working on a post for the blog all about painting kitchen cabinets. If you have anything you have ever wanted to know email me or leave your question in the comments. If this inspires you, I’d love for you to subscribe to my blog by leaving your email above in the box at the top right! I am working on some new things and I’d love to share them with you! Great tutorial. I may have to look into this when we paint our cabinets. Are you going to paint the top cabinets? Hi there soon we’ll be moving into our new place and the kitchen needs a lot of TLC therefore this is something I may be trying also just so the kitchen doesn’t feel so outdated (because it definitely is =)) but thank you for sharing, seems totally easy enough, except for the fact that it may take some time to do, well worth it I’m sure! I know that’s a huge task. We are fixing our cabinets so I can paint them. I am considering chalk paint. Glad I saw how nice yours turned out! Can’t wait to see your tips. The cabinets look great! I need to paint my old kitchen cabinets for my basement remodel and may try this. Thanks for sharing! I’m looking into painting my cabinets as well. However my cabinets are a wood and how do I tell if the paint won’t peel off. Paint and prep work will determine how well your paint will stay on your cabinets. The cabinets must be thoroughly cleaned. If you are ever in doubt you can use primer but if you use the chalky finish paint I used here it is not necessary. My cabinets are painted in semi gloss black. Will they need more prep work besides the cleaning? 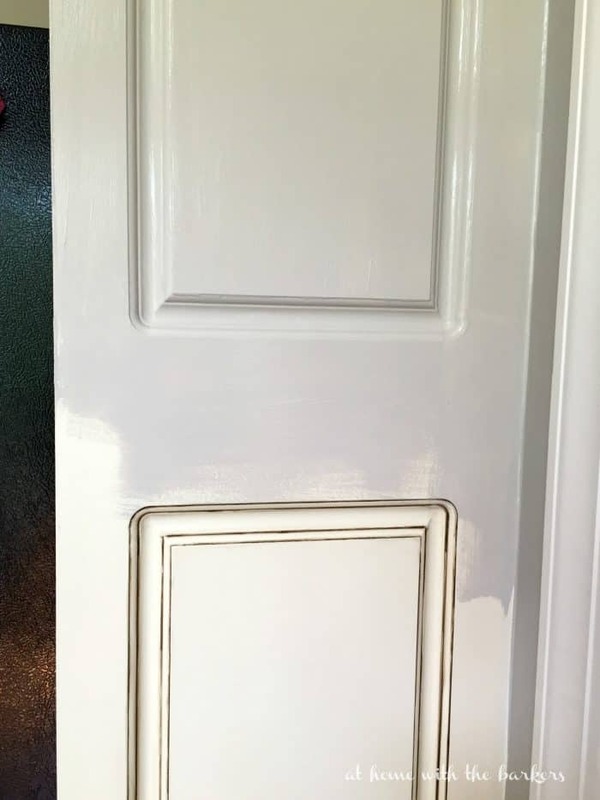 The chalky finish paint will still stick to the surface but if you are ever in doubt you can always go over the gloss paint with a piece of sand paper. I don’t think you will need to but it never hurts. I am planning on downsizing into an older bungalow which might require some decor and renovations. Also may get into furniture restorations as a hobby. So, I am interested in many DIY projects. Your cabinets look great and your kitchen is beautiful! Thanks for sharing. Hi….I am dying to paint my cabinets with chalk paint however they are not oak more of a particle board stock home depot kitchen cabinets do you think using the chalk paint will work. I have alot of cabinets and the thought of priming and painting seems overwhelming! I have the best luck with chalk paint sticking to different surfaces. It is probably your best choice. Did you use the wax & varnish or just the varnish. Just did out bathroom vanity & will tackle the kitchen this winter! Love your colors! Hi, I want to use the chalky paint but also color varnish over it, like your original paint job. I assume I do the varnish before I seal them? What time of sealer did you use? I used the soft touch varnish…I have a photo of it in the post so you can see it. Beautiful I love this ..where can I purchase this paint? I love what you did. I have just started using the chalk paint to paint my rental properties kitchens. I wonder if the varnish makes the color change over time? I would love to use it instead of the wax!! HI! 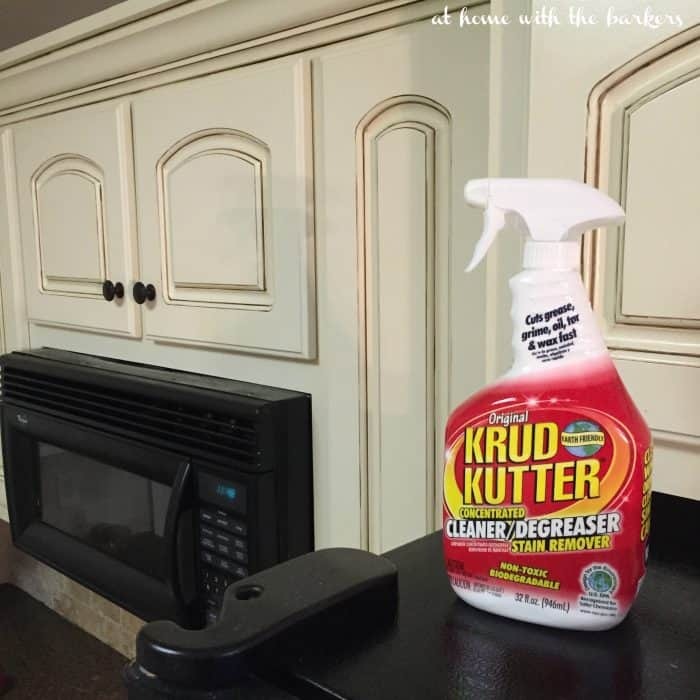 I love your kitchen makeover–so much work but so worth it! I was wondering if you could share the name of your “before”–not the “before the before”-HA!–wall paint color in your kitchen was…it’s exactly what I need in my kitchen! Thank you! This tutorial is the best I’ve seen so far. It looks very simple. So my question is- is it really this easy and how long will it take? Did you remove your drawers as well? I love the finished product. Great job! I love the way these turned out, and we are planning to do the same to our kitchen. How has the paint/soft touch varnish help up since the makeover? Thanks for sharing your awesome tips! I wanted to ask how your kitchen is holding up? I am fixing to redo mine and I don’t want to spend the money on this paint if it isn’t going to hold up to the wear and tear a kitchen has to go through. Looks so good.My cabinets are white and need to repaint them. How do I get the raised edges to stand out more? I plan to use the paint that you used on yours. My wife and I just purchased a house and the kitchen cabinents are painted with white latex paint. We would like to glaze them but had a few questions. Is the glaze you use latex with latex color paint for the color? So we would need to clean the cabinents, mix the clear latex glaze with a colored latex paint, put the glaze on, and put a sealer on last? Your kitchen looks great! I love the contrast. I have maple cabinets. I’m thinking of painting them. I’m terrified if leaving “brush marks.” It does not look like you have any. What’s your opinion on that? What type of cabinets do you have…maple, oak or something else? Your kitchen looks great. It doesn’t look like it but I’m just wondering if you have brush marks? I have maple cabinets. I’m thinking of painting them but I’m terrified of brush marks. I’m thinking between chalk paint and advance my B Moore. 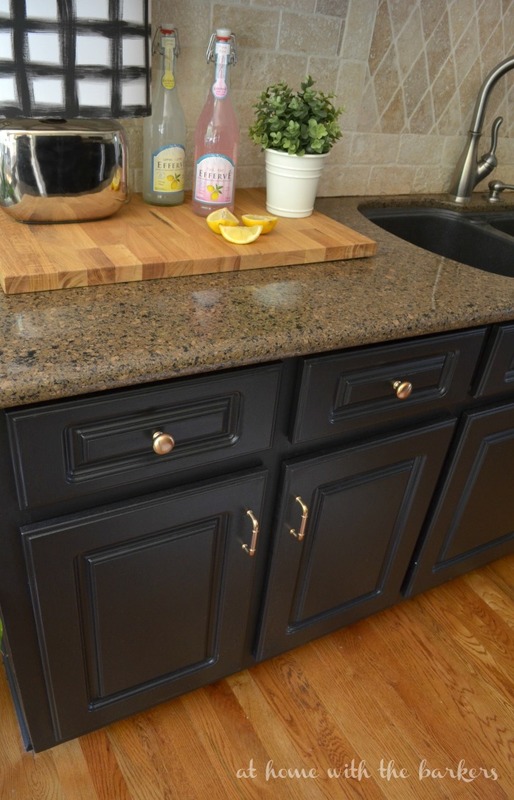 What type if cabinets do you have….maple, oak? My cabinets were smooth so there aren’t any wood grains to see, so keep that in mind. Wood grain texture will show through paint no matter what type of brush you use. Use a sponge roller brush for cabinets and a self leveling paint to make a smooth finish. I like Sherwin Williams Cashmere. I love it! I have been wanting to paint my kitchen cabinets but was scared. I think I will do it now. Thank you for the good tips. Thanks so much for your information on chalk pant. I’m planning on white on top of real wood. With two coats I should be able to hide some of the grain correct? Also; how do you get the black streaky lines around the inside of the carved out edge in the doors. Like your brownish color on the antique white doors? Your kitchen has been my inspiration for our kitchen reno! I am wondering why you chose the varnish that you did? I plan on using the Americana Decor chalky paint also, but was considering using some type of poly to seal it. Is the varnish you chose a better choice? Does it need to be reapplied over time as wax does? You are so sweet! I’m glad to have inspired you. Honestly, I hate to use poly. 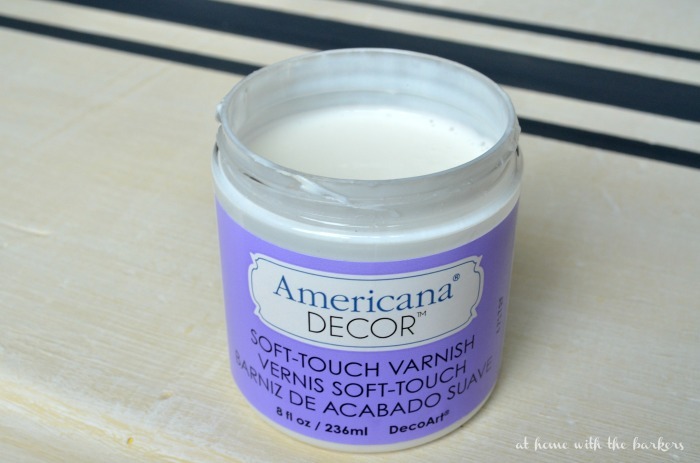 The Americana Decor Soft touch varnish is much easier. There isn’t any terrible smell, no sanding between coast and I love the way it feels. Sort of like velvet. It is not like wax. You should not need to reapply. If I were you I would get a piece of wood and practice so you can see that you really do like it. Thank you for your input! How many containers of the varnish would you recommend? We have old oak laminate cabinets. Will chalk paint work. I’m painting my cabinets white using the same paint and varnish. I’ve completed a “tester” door and I love the color/look of the paint. However, I used a fine/dense sponge roller on the second coat for a smooth look, but I still feel the pattern from the roller. It’s the finest roller I have found. Are your cabinets completely smooth or do you have the texture from the roller as well? I’m trying to figure out how to get rid of that. Also, I’m finding the varnish on top of the white has a slightly yellow tint to it. Any reason you used that instead of wax? Thanks for any suggestions you have. This is my first time painting cabinets. The only way to get a totally smooth surface is using a sprayer. Mine have that slight roller texture as well and I think they still look great. The soft varnish should not look yellow that I am aware of BUT you can surely use wax! That is just preference. Good Luck! Where do I buy the paint? I like to use a brush first in order to get in all of the details. The sponge roller is so my final coat of paint is smooth. Did you paint your baseboards the same color as your cabinets or did you paint them a different color?? Yes I did, same color. I consider that part of the cabinet. Looks great. We have laminated cabinets from the early 90s. Would this work on them? Chalky Paint is suppose to stick to everything and I think it would BUT I can’t be sure. I have come back to your blog a bazillion times looking at your cabinets. Ihopefully it doesn’t notify you when someone is “stalking” you. I finally decided to dive in. I’ve painted my cabinets the carbon color and love love love them prior to the varnish. When starting the varnish it looks streaky to me, will this go away after multiple coats? If you didn’t have this problem maybe I should stop before I ruin all 26 of my cabinet doors. We’ve painted our bathroom cabinets with the carbon color, but can’t decide on the varnish. I love the look of yours, but how do they hold up to moisture? Would we be able to clean them? Or do you think we’d be better off with the satin varnish? You will have to seal the paint with something. I think the varnish is excellent and will be perfect for the bathroom. You can clean them once sealed. Where did you get the three tiered galvanized storage thing? I need that!! Are your cabinets real wood or more like a pressed board/MDF type of material? I have white cabinets, and I am interested in painting the cupboards with chalk paint but they are not real wood and more of a synthetic type of material. 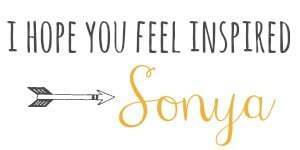 Mine are MDF. 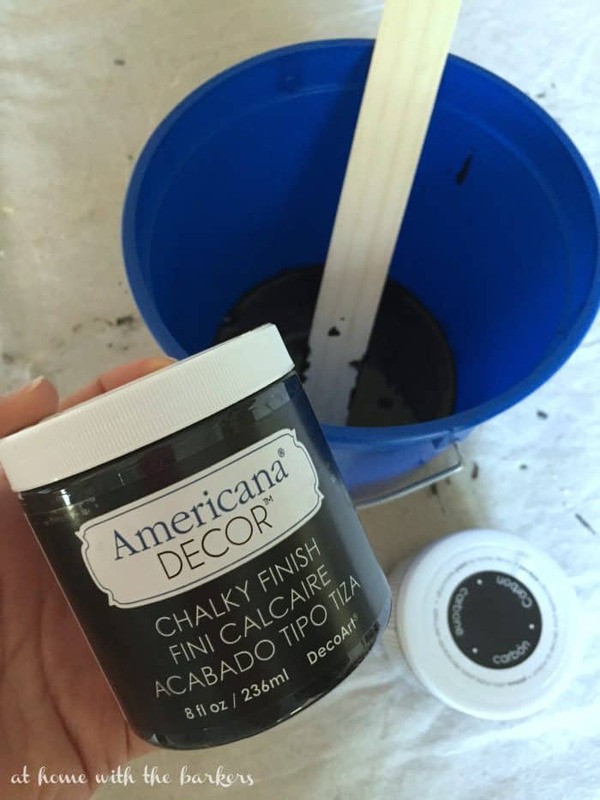 You can use chalk paint and it will work great. I would love to paint my kitchen cabinets but I have those inexpensive vinyl coated white cabinets. Have you tried painting this type? Yes this inspired me, i wasn’t aware of multiple chalk paints. 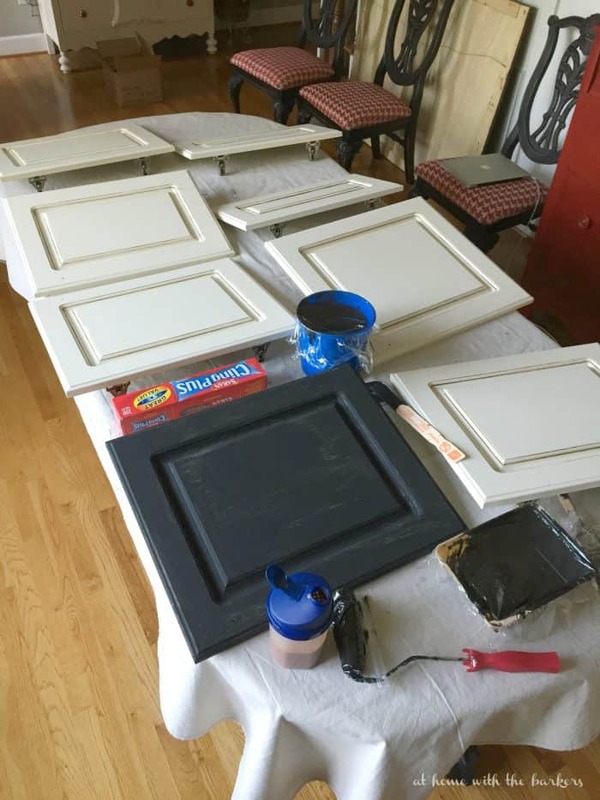 Your cabinets look amazing, I love the black… The only thing that’s scares me, my cabinets were painted white when we bought our house, the paint is starting to peel off. But the cabinets are real wood, will chalk paints make them look brand new. I really want black cabinets. If you decide to go with black I would make sure it isn’t stark black. Maybe more charcoal, gray black. Depends on the look you are going for but if you do a great job on the painting they will absolutely look new again. I was wondering how your kitchen cabinets are holding up with the chalk paint and the varnish over it? Would you do it the same way again or something different? Beautiful make over! My husband & I are planning our remodle. However, I’m scared if we do what my husband wants; which is leave the cabinets & paint as they are, would the paint dry like a dripping effect? Also, when we moved in few months ago I scrubbed the cabinets as well as I could with cleaning spray & a rag. Although it not perfectly clean & a few cabinet doors still have a sticky feel from cooking grease. Would that effect the paint absorbance if it doesn’t come off all the way again? It will be very important that all of the oil/grease is removed. I would sand to ensure smooth perfect coverage. 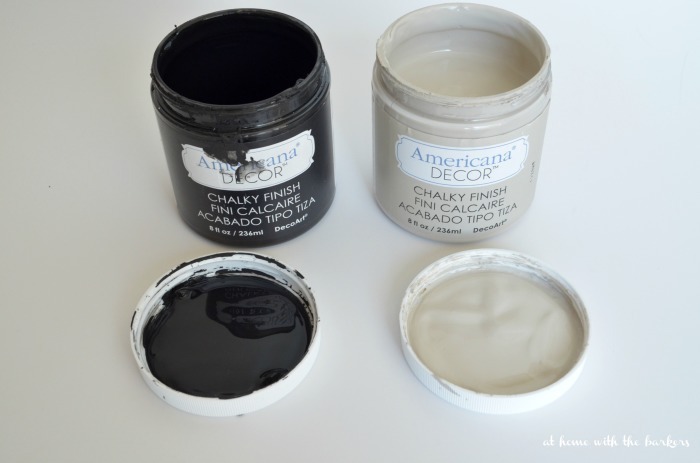 Chalk paint is the best product to try on it. I can’t be certain of the outcome because it is not a surface I have painted it on but I do think it will adhere. I would test a small hidden area to be sure. I would love to know more about painting my cabinets. They are pressed wood.